Ramblings of a Daydreamer: Blue Sky Days cover reveal! 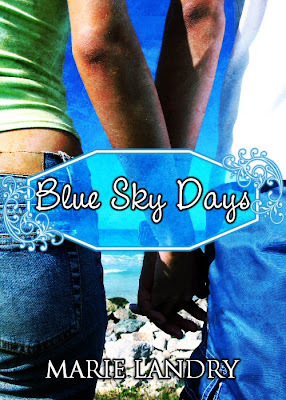 Blue Sky Days cover reveal! Today is a very exciting day for me. I have the cover of my novel finished and I want to share it with you guys! When I first wrote Blue Sky Days seven years ago, I had a very distinct cover in mind. I didn’t know how to go about making it happen, short of hiring a photographer, or finding models and taking the pictures myself. I searched online for ages, and the picture I ended up using was one I had chosen for my trailer and had never even considered for the cover. Then one day, I was going through my images, and it just clicked into place. It was perfect. I made a mock-up, was very happy with it, asked friends on Facebook for input, and ended up with about half a dozen different versions using the same picture, based on the suggestions of my friends and fellow writers. This is the one I’m happiest with, and I hope you all like it, too. When Emma meets Nicholas Shaw, everything changes. He's unlike anyone she's ever met before, the kind of man she didn't even know existed in the 21st century. Carefree and spirited like Daisy, Nicholas teaches Emma to appreciate life, the beauty around her, and to just let go and live. Between Daisy and Nicholas, Emma feels like she belongs somewhere for the first time in her life, and realizes that you don't always need a plan - sometimes life steers you where you're meant to be. I’m still in the (excruciatingly slow) process of doing final revisions with my editor, and I’m hoping to have the final product out to reviewers by November or December so they have a month or two to read and review it before it comes out in January. If you’d be interested in reviewing it (most likely in PDF form until I can get it in all digital forms, and eventually in paperback), please contact me at irishstar_83(at)hotmail(dot)com – I’ve got a list started with the wonderful people who have either volunteered to review it, or who I’ve asked, and I’d love to add your name to that list! I also started working on the trailer last night, and I’m done except for the music and a few minor tweaks, so keep an eye out next week for the trailer reveal, as well as teasers and excerpts from Blue Sky Days. I love that book cover. It is so pretty! Kudos. The cover looks awesome. The book itself sounds very intriguing, definitely in the "new adult" category that seems so wanted lately. Again, gorgeous cover. I am so happy/excited for you! like everyone else - I'm thrilled for you! !